In school back in 2006 we had an assignment where we had to make something out of plastic. 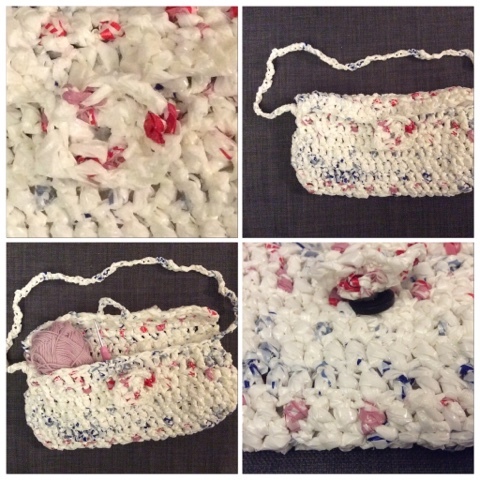 I chose to crochet and design a purse using strips of old plasticbags. I was quite pleased with myself actually and this might be one of the first crochet projects I finished before I started crocheting again as an adult. My teacher was not quite as pleased and gave me a C minus, which I thought was unfair as I had done what the assignment said... Oh well, I still like it, and it is almost waterproof, except for the holes, but now that I have showed it off I think I have to throw it out in my decluttering process, it is though which is why this has been in the closet the past ten years, but I haven't used it and it is time. I have no idea what hook I used or how long this took me, I am guessing about a week, and the button is glued on using melting glue and I glued a flower on top. My mother helped me a lot with tips whilst I did this, so thank you mum. The body was stitched using dc stitches and crocheted together at the side. Then I made chains on the handle and button closing. I would have given myself a B as I did follow the goals I set, not that it matters much. It was however a pain cutting those plastic bags and making this so I do not recommend it.